Striker caught gesturing towards the stands as he left the pitch following Liverpool’s 1-0 defeat. THE FA IS likely to call on Liverpool striker Luis Suarez to explain his actions after he was caught on camera making an obscene gesture towards Fulham fans. The Uruguayan’s night at Craven Cottage went from bad to worse when he was photographed raising his middle finger towards the home support as he left the pitch following Liverpool’s 1-0 defeat. The incident rounded off a frustrating evening for Suarez who was booed and branded a “cheat” by Fulham fans when he touched the ball while referee Kevin Friend waved off the majority of his appeals for free-kicks. The FA’s disciplinary panel is expected to wait until it receives Friend’s match report before taking any action. If found guilty, Suarez could be hit with a two-game ban for bringing the game into disrepute, similar to the penalty which Wayne Rooney received last season when he was caught swearing by television cameras. Suarez is also due to appear before an FA hearing to appeal a charge that he racially abused Manchester United’s Patrice Evra during a 1-1 draw between the sides at Anfield in October, a charge which he denies. Speaking to reporters (see The Guardian) after last night’s game, Kenny Dalglish said that he had not seen the photo of Suarez’s one-finger salute to the Fulham fans. But the Liverpool manager slammed the terrace chants branding Suarez a cheat as totally out of line. You write what you want to write. At the end of the day, we will look after Luis the best we can and I think it is about time he got a wee bit of protection from some people. Email “Suarez faces fresh charge after giving Fulham fans the finger”. 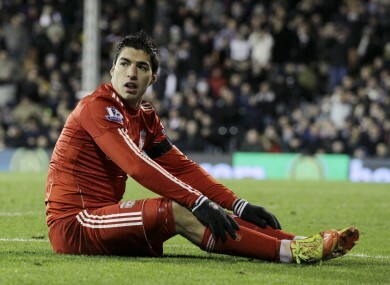 Feedback on “Suarez faces fresh charge after giving Fulham fans the finger”.